For the saint and bishop of Tours, see Saint Volusianus. 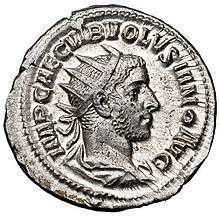 Volusianus (Latin: Gaius Vibius Volusianus Augustus; died August 253), also known as Volusian, was a Roman Emperor from 251 to 253. He was son to Gaius Vibius Trebonianus Gallus by his wife Afinia Gemina Baebiana. He is known to have had a sister, Vibia Galla. The death of Decius in early June 251 led to Trebonianus Gallus' elevation to the throne. Gallus adopted Decius' son Hostilian and made him co-ruler. Volusianus was named Caesar and Princeps Juventutis. Later in 251 Hostilian died of the plague and Volusianus replaced him as Augustus and co-ruler. Father and son were both killed in 253 by mutinous troops in Interamna. ↑ In Classical Latin, Volusian's name would be inscribed as C · VIBIVS · VOLVSIANVS · AVGVSTVS.